Buttery shortbread cookies made with BAILEYS pumpkin spice coffee creamer. Don’t forget to add the pumpkin spice glaze on top! 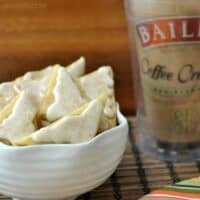 This summer I had the awesome opportunity to try out a few of the new BAILEYS coffee creamers, before they were even released to the grocery stores. I know. Perfect gig for me, right? You guys want to know where my pumpkin obsession came from so early in the season this year? Well, I’ve been drinking coffee with Pumpkin Spice creamer since June! No joke. This past June I had the luxury of indulging in some of Lori’s (Recipe Girl) treats that she made using BAILEYS creamer. And when I say indulge, I mean over indulge. 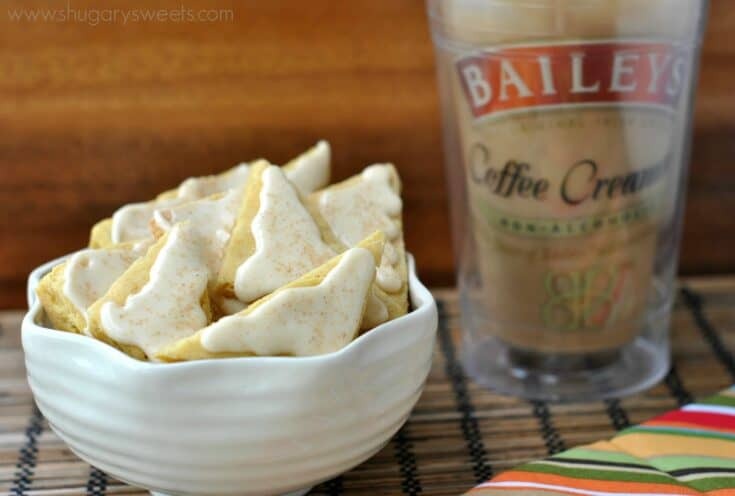 So when BAILEYS asked me to create some recipes using their newest creamer flavors, I was thrilled! 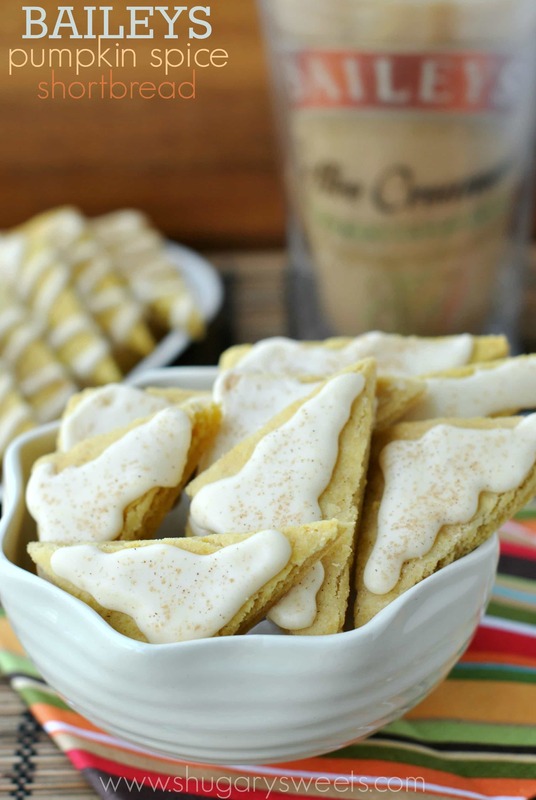 For today’s recipe, I used their Pumpkin Spice creamer to create a delicious shortbread cookie. You all know how much I love shortbread cookies! The creamer adds a delicious depth of flavor, not only to the cookie, but also to the glaze on top! Add just a drizzle of glaze, or spread it on thick like I do! 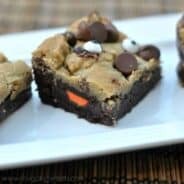 Feel free to stop over at BAILEYS website to check out more recipes! Stay tuned to see the other delicious recipes I created using BAILEYS creamers. Hint: keep an eye out for Red Velvet Cupcake creamer and White Chocolate Peppermint creamer! Buttery shortbread cookies made with BAILEYS pumpkin spice coffee creamer. Don't forget to add the pumpkin spice glaze on top! In a large mixing bowl, beat butter and powdered sugar for 3 minutes, until fully combined. Add flour, salt, pumpkin puree, creamer, cinnamon, nutmeg and allspice. Beat until mixture comes fully together. Drop dough onto parchment paper lined baking sheet. Working with floured fingers, press dough into a large rectangle (about 14x12inch). Bake in oven for 20-25 minutes, until cookies are slightly firm to touch and just starting to brown. Remove from oven and immediately cut into triangles. Separate slightly and allow to cool completely before adding glaze. For the glaze, whisk together the powdered sugar, creamer and pumpkin puree. Pour smooth glaze into a Ziploc bag. Cut of the corner and drizzle glaze over cooled cookies. You could cover the tops of the cookies completely with glaze, or just do a small amount of drizzle on each cookie. Sprinkle cookies immediately with cinnamon sugar blend. Store cookies in air tight container at room temperature. I love the idea of combing pumpkin spice and shortbread. Delicious! Oh my gosh, I want this sooooo bad, Aimee!! I love Baileys. And that coffee creamer. And the video. Fabulous job on this one, Aimee! That creamer is not available in San Diego (yet). I’ve been stalking it and sadly, nothing yet. Soon I hope! Your video was awesome Aimee!! Ugh. I’m such a dork. Great job on the video Aimee! Now you be sure to send me shortbread ok? You did an awesome job coming up with a fun and delicious recipe AND doing a video. Kudos on the amazing gig!!!! Thanks Jocelyn! You’re my number one cheerleader! Great use of the pumpkin spice creamer! Your video is awesome! Ok, now you’re being too kind. I think you mean your video is ‘awkward’ not awesome, LOL!! Ok, yum! Talk about a brilliant idea! This looks delicious! White Chocolate Peppermint … *swoon* But gosh these sound amazing, too! I am compelled to buy everything with the label pumpkin spice (like cider and coffee and salsa – its is a problem!) Shortbread is always a favorite and putting creamer in glaze is genius! Thank you, thank you! 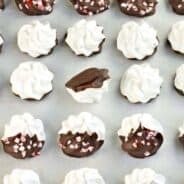 The white chocolate peppermint is probably my favorite 🙂 Wait till you see what I made…. That boozy glaze is absolutely heavenly! these look delish!! could you use Bailey’s original creamer in them though.. that is all i have on hand. You can, but you will lose some of that pumpkin spice flavor! I love pumpkin spice creamer! I have not yet tried the Bailey’s pumpkin spice. I didn’t even know they made pumpkin spice creamer until this past weekend! I bet these little shortbread cookies are amazing! I’d probably have a hard time eating just one or two. Pinned! Oh Aimee! It was good seeing you and hearing your sweet voice! 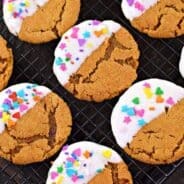 I loved your video and oh yummy wow on these cookies!!! Pinned for sure! I am making these on Sunday for the teachers at work. They look so delicious! Aaah I’m so jealous! It must’ve been a blast to try out new never-before-seen flavors! Love this shortbread though, Aimee. The perfect way to have pumpkin IN my coffee and IN my sweet treats. 😀 YUM. One of the perks of a job I love! I love shortbread! I am not quite sure about the pumpkin spice (I know, I must be one of the few people in the world who don’t go nuts over pumpkin spice), but the rest sounds wonderful! Oh wow!! What a perfect recipe 🙂 I bet it tastes just amazing! Fabulous video, girl! So fun to see you in action. And the shortbread looks so yummy! I love the idea of using creamer to add flavor. And your shortbread looks amazingly flaky! Pinning these for sure!